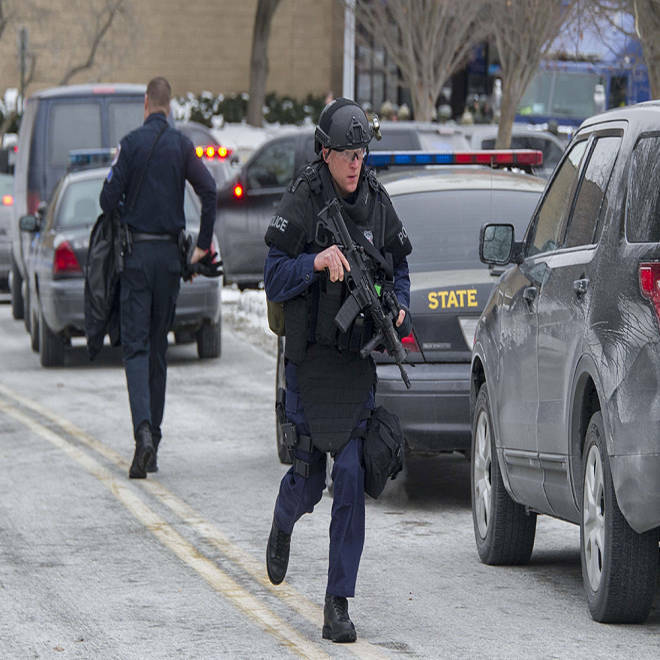 Maryland State Police patrol a mall in Columbia, Md., after a fatal shooting Saturday. Two employees of a skate shop were killed Saturday when a gunman armed with a shotgun and “a large amount of ammunition” opened fire in the store in a shopping mall in Columbia, Md., near Baltimore, before apparently killing himself, police said. The employees were identified by police as Brianna Benlolo, 21, of College Park, Md., and Tyler Johnson, 25, of Mount Airy, Md. The male shooter, whose body was found nearby, had a shotgun and “a large amount of ammunition on and about him,” McMahon said. Investigators said they have tentatively identified the shooter but did not release his name. Officials were planning to issue an update at 9:30 a.m. ET on Sunday. "A search of the shooter's bag found inside the store revealed two crude devices that appeared to be an attempt at making explosives using fireworks. Both were disabled," a police statement read, adding that the mall would be closed Sunday. The victims were found inside and directly outside of the shop, which is located above the food court, McMahon said. “There were a lot of people very close to where this happened,” said Howard County Executive Ken Ulman. Tonya Broughton was enjoying a spa day at the mall with a friend. “The only thing I heard was all the people running and screaming and saying ‘There’s a shooter! There’s a shooter,” she told The Associated Press. The two women huddled inside a Victoria’s Secret store with facial masks still smeared on their faces. McMahon said once investigators were done searching the deceased suspect to assure there were no explosives on his body, they would work on identifying him. “When we have that, perhaps we will have a better idea of what the motive is,” he said. “The tactical teams went through every inch of the mall and it has been cleared,” said Howard County Executive Ken Ulman at a news conference five hours after the shooting. The mall would remain closed through Saturday night, police said. The nearby Howard County General Hospital told police they were treating a victim who was shot in the foot. Four other people with “minor injuries that were not directly related to the shooting” were transported to the hospital, police said. NBC Washington reported that one of the injured had a twisted ankle, and two people suffered seizures. All five patients were released from the hospital early on Saturday night, WBAL reported. Police said the first 911 call reporting a shooting at the mall was received at 11:15 a.m. Officers arrived at the scene within two minutes, McMahon said. McMahon said shoppers followed instructions from mall security to seek shelter. “They have done what we have encouraged them to do in one of these situations,” McMahon said, adding that he had not heard reports of stampedes. Police had staged drills will mall staff in the past to prepare for an emergency situation, he said. Those still inside the mall were evacuated to a movie theater and allowed to leave from there if they did not witness the shooting, Howard County Fire Dispatch calls indicated. The movie theater is separate from the mall, on the opposite side of a parking lot, according to Mall in Columbia maps. A witness told NBC Washington that she heard what she thought was “something being dropped,” but then realized it was gunshots. "They just kept shooting and it didn't stop," she said. 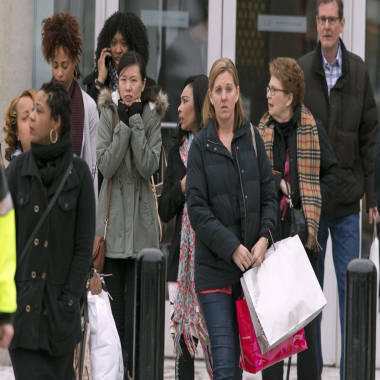 Shoppers are evacuated by police after a shooting Saturday at a malll in Columbia, Md. “It was a busy day,” a mall employee told NBC News. “People started running through our store,” which is at the opposite end of the mall from where the shooting happened, she said. She said associates and customers sheltered inside a stockroom for over 90 minutes before they got in contact with police who told them they could leave. “You really just don’t expect for something like this to happen in our community,” she said. Gov. Martin O'Malley praised the quick actions of Howard County police and first responders in a statement." On behalf of the people of Maryland, I want to express my deepest condolences to the families of the victims and all those affected by this senseless act of violence," O’Malley said. Zumies CEO Rick Brooks also conveyed sympathies. “The Zumiez team is a tight knit community and all of our hearts go out to Brianna and Tyler’s families,” he said in a statement. There have been several violent incidents at U.S. shopping centers in recent months. A woman and a man were killed in a shooting outside a San Diego mall early on Christmas Eve, and earlier in the month a man leaving an upscale New Jersey mall was shot and killed during a carjacking. At a different New Jersey mall in November, a gunman opened fire and later holed up in a back room before shooting himself in the head. No one else was injured. In a December 2012 shooting at an Oregon mall, police said a gunman appeared to be on a "mission" to kill. Two people died and a third injured when the man opened fire with an AR-15 semi-automatic rifle inside the mall teeming with holiday shoppers. In addition to those incidents in the U.S., an upscale mall in Nairobi, Kenya, was targeted in September, when al Qaeda-linked militants carried out an attack that killed 67 people and injured up to 200. The attack — which the Islamic terrorist group al-Shabab claimed responsibility for — lasted four days. NBC News' Pete Williams and Mike Kosnar contributed to this report. Howard County, Maryland Police Chief Bill McMahon tells reporters that authorities believe the shooter at the Columbia Mall is among the three people dead, and that the mall is still being cleared by SWAT teams.